Nigerian Biography: Obiageli Ezekwesili (Oby Ezekwesili) biography. Obiageli Ezekwesili (Oby Ezekwesili) biography. Obiageli Ezekwesili popularly known as Oby Ezekwesili hails from Anambra State of Nigeria. the University of Lagos. She later traveled to the Unite States where she enrolled in the Kennedy School of Government, Harvard University and obtained her Masters Degree in Public administration. She also trained in the Accountancy firm of Deloitte and Touche and became a chartered accountant. 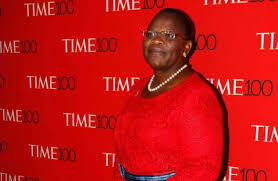 Ezekwesili worked with Professor Jeffrey Sachs at the Center for International Development at Harvard. Obiageli Ezekwesili co-founded Transparency International, an anti-corruption body based in Berlin, Germany. There, she was one of the pioneer directors. She later came back to Nigeria and served as the Federal Minister of Solid Minerals and later as Federal Minister of Education during the second-term of president OlusegunObasanjo. Oby Ezekwesili was once the Vice-President of the World Bank's Africa division, a position she held from May 2007 to May 2012. During the regime of president Olusegun Obasanjo Obiageli Ezekwesili held the position of the Pioneer head of the Budget Monitoring and Price Intelligence Unit (nick-named Due Process Unit). It was at that time that she was given the sobriquet of "Madam Due Process" owing to the outstanding work she led a team of professionals to do in sanitation of the public procurement or contract award at the Federal level in Nigeria. The Nigerian Bureau for Public Procurement legislation can be described as her brainchild. Other legislation she engineered include the NEITI legislation and the new Minerals and Mining legislation. Apart from holding positions as the Minister of Solid Minerals (Mines and Steel) in June 2005 during which period she led a vibrant reform program that led to Nigeria being globally recognized as a credible mining investment destination. She was also the Chairperson of the Nigeria Extractive Industries Transparency Initiative (NEITI). It was at this period that she led the first ever national implementation of the global standards and principles of transparency in the oil, gas and mining sector. Oby Ezekwesili was appointed the Federal Minister of Education in June 2006, a position she held until she went for an appointment in the World Bank in May 2007. Her appointment as Vice-President for the Africa Region at the world bank was actually announced in March 2007, by President Paul Wolfowitz. On October 1, 2012, Bharti Airtel, one of the world's leading telecommunications firm having operations in 20 countries, named Obiageli Ezekwesili as a director on its board. Oby is also one of the board members of World Wildlife Fund (WWF), The Harold Hartog School of Government and Policy, the School of Public Policy of Central European University, New African magazine and The Center for Global Leadership of Tufts University. In May 2012, the University of Agriculture, Abeokuta, Nigeria, awarded Ezekwesili an honorary Doctor of Science (DSC) degree. After nearly 300 girls were abducted from Chibok by the Islamist militant group Boko Haram., Oby Ezekwesili co-founded the viral #BringBackOurGirls campaign on social media, which urges action to bring the girls back. Some international personalities including Michelle Obama, Alicia Keys, Chris Brown and others have identified with the clamor for the release of the abducted schoolgirls and the #BringBackOurGirls campaign.